Restaurant management is a hot degree path, and for good reason: The restaurant industry is growing across all states, and those facilities need someone to handle everything from overseeing staff to bookkeeping to setting up layout and design. Restaurant management schools and degrees are there to meet the demand, offering education that culminates in every degree level, from basic certificates to the PhD. Amy Fahland began her career on cruise ships, and eventually gave up the sea for the sun and sand of Maui. She has worked for several years in management positions at various West Maui restaurants, and joined DK Restaurants Hawai’i as Restaurant Manager at Sansei Seafood Restaurant & Sushi Bar Kapalua in the fall of 2012. Amy’s upbeat, detail-oriented style of management was quickly recognized as a major asset and she was promoted to general manager just a year later. There are one million restaurant locations in the United States. 10 percent of the overall U.S. workforce is employed by eating or drinking establishments. Restaurants pull in $1.9 billion per day, and over $709 billion each year. San Francisco is home to the most eateries per capita. This is followed by Seattle, Boston, New York and Los Angeles. Restaurant managers are responsible for the day-to-day running of eating and drinking establishments. This might include everything from staff training to daily accounting to overseeing food preparation. Ultimately, their job is to ensure that customers are happy with their experience and that the restaurant operates at a profit. Restaurant management schools and degrees help them achieve this goal by offering targeted courses, such as those in business, accounting, management and the like, that give managers the skills and knowledge necessary to run anything from a small, family-owned restaurant to a large chain with locations across the nation. These programs can be found in vocational schools, community colleges, four-year schools, and even specialty schools, where students are trained in all aspects of hospitality. Vocational and technical schools train restaurant managers to be hands-on professionals. Courses are quite targeted toward the profession and result in a certificate or diploma. These programs typically take between six months and one year, and might consist of one long course, or several shorter ones. Those who want to move into a particular area of the culinary world might choose between specialized certificates, such as those in baking and pastry arts, bartending, catering or beverage service. These schools offer certificates and diplomas, and in some cases, two-year degrees. Focused strongly on the restaurant business, most of the programs do not include general education courses beyond those that might benefit managers, such as communications or business. Even management courses are specifically targeted toward solving the problems that might face those in the restaurant business. In most of these schools, hands-on training is also required, so that managers will understand how to do everything from work ‘front of the house’ to ‘back of the house’ to behind-the-scenes. Community college programs for restaurant management offer two tracks for students: The first is the general track, which prepares them to move into the bachelor’s degree program, and the second is the applied track, which focuses on preparing students to move directly into the workforce upon graduation. Those in the general track will take general education courses, such as world studies and English, as well as management courses. Those in the applied track will take fewer general education courses and instead focus on the finer points of restaurant management, including business accounting, logistics, management, business law and the like. Programs through community colleges typically last two years, require completion of about 60 credits, and culminate in an associate degree. Those who want to work in more upscale establishments or hope to run their own business might benefit from the bachelor’s degree. These programs include general education and targeted courses within the major, as well as required internships or hands-on training that proves proficiency in the restaurant or hospitality business. Courses might include those in business administration, management, human resources, accounting and business law, as well as food planning and preparation, food logistics, sanitation and nutrition. These colleges and university programs typically require 120 credit hours to complete, and can usually be wrapped up with four years of full-time study. Those who choose accelerated programs might graduate in three years. Choosing the best restaurant management schools and degrees can be a daunting task. How can students narrow down the many options to the ‘short list’ of those that are most suitable for their needs? It starts with looking at the must-have elements every restaurant management program should have. Here’s what students can look for when it’s time to make that tough decision between schools. Teachers who have an intimate, working knowledge of the restaurant industry are preferred, and those who are actively working in the restaurant industry might be even better. Look for those who have some serious weight behind their resume, such as those who have worked in hospitality, culinary schools, or high-end restaurants in various capacities, and understand first-hand what it takes to manage a busy establishment. 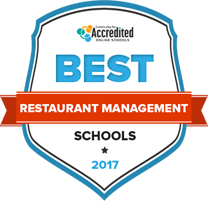 Some restaurant management schools are well-known in the industry for turning out students with impressive credentials and abilities. The reputation of a school can be a strong indication of just how well it prepares students to move into their careers. However, keep in mind that just because a school hasn’t been mentioned in the media or otherwise found a measure of “fame” does not mean that it isn’t worthy of a second look. Is the school or program accredited? The Accreditation Commission for Programs in Hospitality Administration is the accrediting body for programs in all aspects of hospitality, including restaurant management. The ACPHA currently accredits 63 national programs and two international programs; however, new schools are applying for accreditation all the time, so it’s a good idea to check the ACPHA website from time to time to discover new programs that have made the cut. When someone is the best of the best, word tends to get out. Often a school will be quite happy to offer up a list of renowned alumni; but if you can’t seem to find a ‘bragging list’ of hot-shots who graduated from there, it doesn’t mean the school isn’t churning out excellent managers. Look at some of the most popular and celebrated restaurants in the world, then look at who actually runs them. Where did those graduates go to school? What does the career path require? The proper school depends greatly on what is ultimately required for the career path. If a particular restaurant wants to hire someone who holds a bachelor’s degree, entering a certificate program might not make sense. If a student has their eye on working in a particular restaurant, pay close attention to the credentials that restaurant prefers before settling on the short list of restaurant management schools and degrees. Is there room to move into other facets of the profession? Restaurant management doesn’t necessarily put someone on a straight and narrow career path. There is a lot of room to maneuver in the world of hospitality. Someone with good management skills might step out of the restaurant industry and work in lodging, travel and related areas. A degree path that offers a well-rounded education that touches on all aspects of the hospitality industry is a plus. The chance to work with some of the hottest restaurants in the world is a big plus. Internships should offer hands-on training for those who want to move into management, including internships that allow for plenty of time to ‘shadow’ the managers of a busy establishment. Though restaurant managers can begin in the field with only a high school diploma, many employers are now looking for those who have formal training in restaurant or hospitality management. Students can choose from a variety of paths, from the basic diploma or certificate in restaurant management to a doctoral degree with an emphasis on one of dozens of concentrations. Well-established restaurants can afford to be picky about who they hire, and might look for those who have serious education under their belt – a bachelor’s degree at the minimum. Most of these programs can be found either on campus or online; those who take the online programs should keep in mind that the internships are still required, and must be completed in a restaurant or other suitable facility approved by the school. Restaurant management programs at this level often include hospitality and hotel management as well. The certificate provides a strong overview of the business and prepares students with courses in accounting, cost controls, legal aspects of the restaurant industry, marketing, menu planning, food preparation, sanitation procedures, purchasing, logistics and the like. The certificate program typically takes one year to complete. Programs that include an internship requirement might take a bit longer. Focuses on accounting, budgeting, basic bookkeeping methods, an understanding of accounting software as it applies to restaurants, and pertinent information on tax reporting. This course covers cost factors, government regulations, the logistics of purchasing perishable items, bidding procedures, receiving operations, inventory control and storage needs. In choosing a restaurant management degree, students have two basic options: The associate of arts, which prepares a student to go into the industry while serving as a stepping stone to the bachelor’s degree, and the associate of applied science, which readies students to move directly into the workforce upon graduation. Either way, the program typically takes two years to complete, and touches on points that are important in restaurant management, including financial accounting, marketing, food safety, government regulations and business law. Focuses on designing, planning and implementing events, evaluating the event during and after, the manager’s role in the event, specific points of food service during the event (as part of the overall hospitality planning) and legal issues associated with the planning. Deals with how to handle employee relations, requirements for hours worked, payment and taxes, discrimination, harassment, benefits and compensation, privacy expectations, workplace safety, appraisal of performance and proper termination procedures. The bachelor’s program in restaurant management is considered the minimum for those who want to work in top-notch restaurants or culinary establishments. The program typically requires four years of full-time study and culminates in the Bachelor of Science degree. Hands-on experience is required, usually in the form of an internship, but some schools will accept work experience as meeting that requirement. Though the student will take several general education courses, the final few years are typically filled with targeted courses that allow for specialization in areas such as conventions and meetings, dining room management, banquet management and the like. An overview of the wide variety of cuisines commonly served in restaurants, the use of indigenous ingredients, timing and organizational skills in food preparation, plating and serving, and teamwork in the kitchen. Extensive studies of wine and wine-making, including methods, regions where various wines are produced, geographical impact, biological components of wine, cultural impact of the wine process and more. Those who have already earned their bachelor’s degree in restaurant or hospitality management can move into the master’s degree program. The program typically takes two to three years to complete, and is often tailored to working professionals – therefore, these courses can often be taken entirely online. Some programs require that certain courses already be completed before entry, such as managerial accounting or introduction to advanced restaurant management. Unlike the bachelor’s program, the master’s degree does not require general education courses; rather, the degree path is very specific to the chosen concentration. Students will be required to complete a master’s thesis, professional paper or capstone project, each consisting of original research, in order to graduate the program. They might also be required to complete an advanced internship or show work experience in the restaurant business. Instruction on design of food service facilities, including feasibility, development and marketing, location and arrangement of equipment, proper utilization of space, flow patterns, human interactions, styles of service, operational requirements and the like. Comprehensive look at pricing strategies, accounting, theory and practice of revenue management, mathematical analysis of hypothetical situations, and in-depth training on Excel. Those who want to reach the pinnacle of the restaurant management profession can pursue the PhD in restaurant or hospitality management. Some schools offer a dedicated degree in restaurant management, while others offer the PhD in business with a concentration in hospitality management. Either way, the degree will prepare students to move into not only higher-paying positions in the restaurant industry, but will also give them the opportunity to teach or conduct research. Focuses on issues such as food safety, foodservice consumer interests, food production, waste management, product development, and the short-term and long-term implications of problems associated with each point. Designed to teach students about personnel issues on a large scale, such as with enormous facilities, including casinos, resorts and the like. Examines both philosophical and practical ways to establish and direct human resource operations in major foodservice organizations. Restaurant management schools and degrees can carry a student only so far down the road to success; some of that success is made through the proper skills, the right tools, work experience and more. Here are some points that can help students ensure they have what it takes to succeed. Those who work in any hospitality environment, whether a hotel or restaurant, typically have an innate desire to help people. This often includes having a great deal of patience with frustrated guests, looking for ways to make restaurant patrons happier with their experience, and figuring out the best ways to make a particular facility stand out among others for the impeccable customers service. It has been said that management is nothing more than excellent organization, and that is definitely one of the most important parts of managing a restaurant. Those in the business must be able to juggle numerous things at once, multi-task like crazy, and make sure those they manage are organized, too. Getting the point across quickly is very important when time is of the essence; and in a restaurant, the clock is always ticking. Learning how to communicate well via social media, written press releases, interviews and more is also vitally important, especially for the manager who works with a restaurant that is often in the public eye. Good management requires someone to step up and take charge of a situation, including delegating tasks, hiring the right people, managing problems as they arise, and doing it all with a very decisive attitude. The ability to lead is an innate thing. Those who have it often turn out to be the best managers. The restaurant business is quite volatile. Many establishments are out of business soon after opening. A good restaurant manager has to be willing to take risks, especially if they intend to run their own place. These risks might lead to failure; in that case, they must be willing to look at what went wrong, learn from that mistake and start again. Though restaurant management schools and degrees can impart a great deal of knowledge, there is a reason that all of them require hands-on training or internships: Nothing prepares a manager to work in the field more than actually getting out there and doing the work. That experience hones skills in a way that no classroom ever could. That’s why restaurant managers should look for any possible experience that might pertain to their goals, from working as a prep cook to waiting tables to handling the books. Eventually all of that experience pays off. In most cases, certifications are not required for those in the restaurant industry. However, certifications can look great on a resume while providing a level of knowledge that can enhance the manager’s work efforts. Earning the Foodservice Management Professional certification is a great way to begin. The Certified Restaurant Facility Professional certification is also a good bet. Students could also reach out to peripheral certifications, such as that of Certified Hotel Administrator or Certified Hospitality and Tourism Management Professional, in order to enhance their employment possibilities. Restaurant managers can often be found “working the floor,” or mingling with customers, ensuring that the staff is doing their job, offering wonderful customer service and being a very active presence at the restaurant. When the shifts are over, those same managers might be huddled in the back room planning out a new menu with staff, or working quietly alone on the accounting. Students who choose this concentration are poised to handle what happens in the ‘back of the house,’ where the food is prepared, as well as oversee a busy bar area. This concentration is designed for those who plan to work with large national chains, and prepares them to handle more than one restaurant at a time, from a hands-off management point of view. Designed for those who want to help the environment, these managers focus on keeping hotels and restaurants as sustainable as possible; this might include things like sourcing local organic meats and using a particular type of equipment, such as paper straws. These managers specialize in conventions, meetings, major events and more, all of which require intensive coordination with other managers to ensure that the event moves smoothly in all aspects. Feeding those at certain events requires intense attention to detail and strong organizational skills; students who choose this concentration will be prepared to handle everything from weddings to major conventions to the needs of workers on a film set. I start my work days at home every morning with managing our social media, answering emails, and responding to phone calls. I want to be proactive in handling as much as I can since you sometimes never know what the shift will bring. It sets me up for success for the day. Heading into work in the early afternoon, I check in with the chef about our daily specials, parties/events, and product quality issues or concerns. I meet with my Assistant General Manager about staffing issues or concerns, daily projects, and recapping from the night before. I will check in with our lead host about the reservations for the evening and any special requests or people of importance. Next, I will do our daily walkthrough checklist and put together our daily specials page. Starting pre-shift at 4:45 and promptly opening the door at 5:15 to start service. Running the floor shift consists of helping the hosts, bartenders, servers, and support staff to ensure food quality and service standards are met. Making connections with our guests and ensuring our staff is supported are the most important things to me. What drew you to restaurant management? I find great joy in coaching, training and seeing people develop. I like the challenge of anticipating the guests’ needs and exceeding their expectations. How did your higher education help you with your current work? Being able to stay organized and stay self disciplined. Developing a team and seeing them succeed. It is never about you. Any guest complaint isn’t personal and fixing the issue before they leave the restaurant is the most important thing. Making sure your staff feels appreciated and well taken care of. Stay organized. Students who are considering anything from a full-fledged degree to a certificate program can find out more about accreditation here. This site offers information on education, certifications, jobs, and other resources of interest to those in the culinary world, including chefs, hostesses and managers. This non-profit organization offers information about events, scholarships, local events, various chapters, and numerous benefits to members. This site includes an education center, career information, news and resources, advocacy, community resources and more. Since 1976 this journal has offered up original research and pertinent articles for those in all facets of the hospitality industry. Published quarterly, it is a great resource for anyone in restaurant management. This organization offers the Foodservice Management Professional designation, as well as information on scholarships and job opportunities. This site for industry professionals offers information on events, member tools, education, certifications and a resource library, among other points. Those who graduate with restaurant management degrees are qualified to work in schools, ensuring the proper nutrition for children. The site includes information on education, professional development, research and more. This site offers membership perks, including an annual convention, research, a crisis toolkit, information on sponsorship and more.